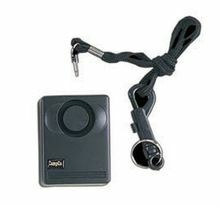 The UZI-PA-1 Personal 130-DBL Alarm features an LED Light and pull-pin. The alarm is rated at 130-decibels and features a flashing LED light and a waistband clip. UZI combines advanced technical concepts with innovative designs to produce products used and trusted by the Army, Secret Service and Special Forces. Since its launch in the 1950s, UZI has become one of the world's most famous firearm brands and a 20th century icon. The screaming siren produced by this small unit is designed to attract attention and bring help to your situation. Item Dimensions, Length x Width x Height (In): 2.25 x 1.25 x 2.75 Uses 1 9 volt battery, not included unless ordered with this item from dropdown menu.